Whether you are heading out for a glass of wine after work, with friends, for date night, or as an accompaniment to a flavorful meal, Connecticut offers diners an ideal experience. 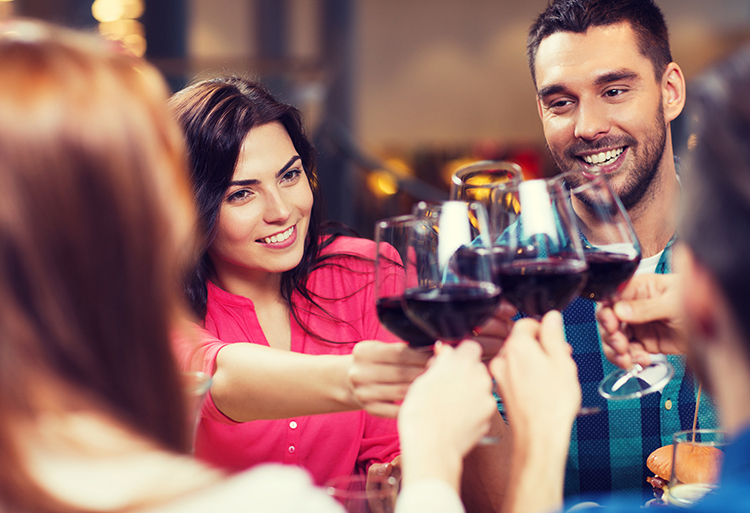 We’ve rounded up the Nutmeg State’s favorite wine bars, including fine dining options as well as casual venues to simply enjoy good wine and good company. With outdoor seating and wine flights, Ballou’s Wine Bar is a very cool option for those looking for a casual and fun evening out. Mondays and Wednesdays have a wine flight special of $10, which is a selection of any three wines sold by the glass. Ballou’s also serves food, such as fondue, pasta, pizza, and more, to perfectly accompany their wines. Located upstairs at Bernard’s Restaurant, Sarah’s Wine Bar offers a different menu of small bites, larger meals, and a casual atmosphere. At Sarah’s, diners can enjoy their wine to the tune of live entertainment in the form of local musicians. Sarah’s has over 1,300 wines on their menu, so prepare to spend a bit of time deciding on the perfect bottle. Nouveau Monde has a great wine by the glass menu and shareable plates and entrees. This is the perfect wine bar to visit with a group of friends as the interior is comfortable, cozy, and spacious. The wine menu also features sections with “interesting wine options” that offers drinkers clear and easy to understand descriptions. Wine is also available by the bottle. Tablao Wine Bar & Restaurant has an interior that screams date night or girls’ get together, but be sure to come hungry as the snacks and meals to accompany the wine are scrumptious. The wine selection here focuses on wine from Spain and South America and an extensive cocktail and craft beer menu is also available. Barcelona Wine Bar is a popular U.S. chain that transports you to the wine bars of Europe. Diners will be treated to delicious meat and cheese plates, small bites, and an enormous selection of wines. Raise your glasses to great nights at Barcelona Wine Bar. Located in a renovated gas station, MBar provides a cool venue for a date night. Cozy up on their comfortable bench seating with a glass of wine and tasty snacks. Among other options, MBar serves Saltwater Farm Vineyard wines, a local vineyard that is loved for its really delicious reds. Café by day and wine bar by night, Koffee is a relaxing location for after work drinks. Koffee Afterdark aims to provide customers with an unpretentious venue to chat with friends over flavorful glasses of wine or craft beer. Wine selection changes frequently and menu descriptions simply note if the wine is red, white, or rosé and other funny, easy to understand facts. When visiting Paella, opt to sit in the wine cellar to be surrounded by shelves and shelves full of wine bottles. The wine menu at Paella is several pages long and offers cava and wines from Spain, South America, and California. In true Spanish form, this wine bar offers happy hour specials every day from 4 p.m. to 7 p.m., where tapas dishes can be enjoyed with a free pitcher of sangria. Harvest focuses on farm to table meals accompanied by great wine. The wine menu has a large selection of sparkling wines, rosés, whites, reds, and after dinner drinks. These drinks perfectly accompany their fine menu that features options such as ricotta gnocchi, grilled salmon, and lobster rolls, but do note that Harvest is one of the pricier options on this list. Hop onto one of the leather bar stools and order a glass or bottle off their extensive wine list. As a perfect accompaniment to your glass of red, opt for a gorgeous plate of cured meats and fresh cheeses such as coppa spicy with burrata. Brunch, lunch, and dinner is also served at Lugano.